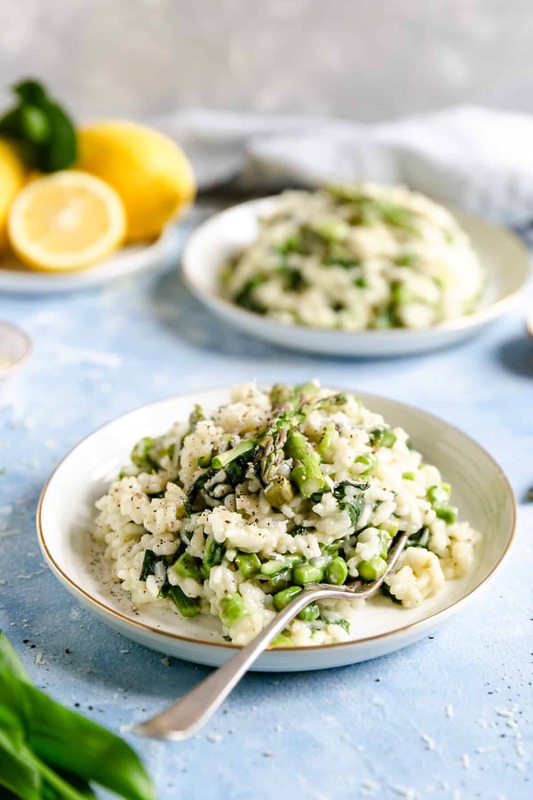 Wild garlic and asparagus risotto- perfect dish to celebrate new season and it’s glorious, fresh produce! This easy dish will make great weekend lunch or weekday dinner! Full of flavour, simple ingredients and less than 30 minutes to cook! Spring has sprung in the UK, and we are finally enjoying some warm, sunny weather again! This year, I’ve celebrated the first day of Spring by going on a wild garlic foraging date with my friend Lindsay! 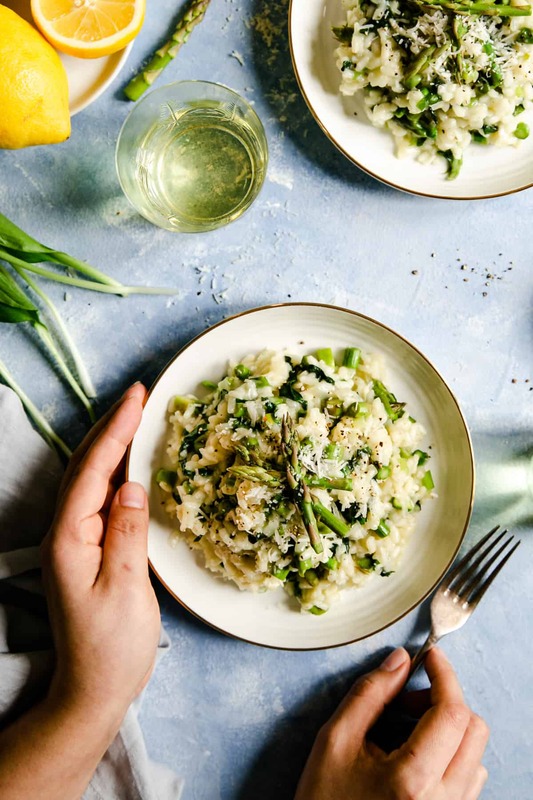 Wild garlic and asparagus risotto- spring on the plate! 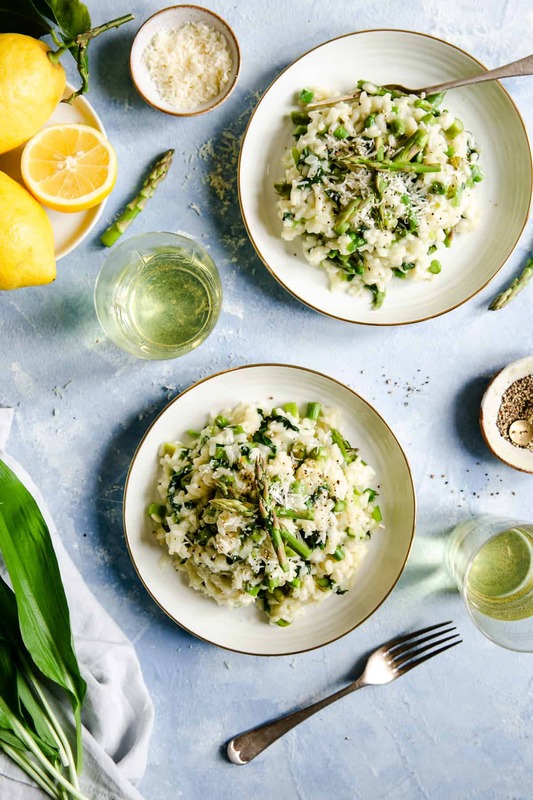 Today’s recipe for this wild garlic and asparagus risotto is ideal to celebrate the arrival of Spring. 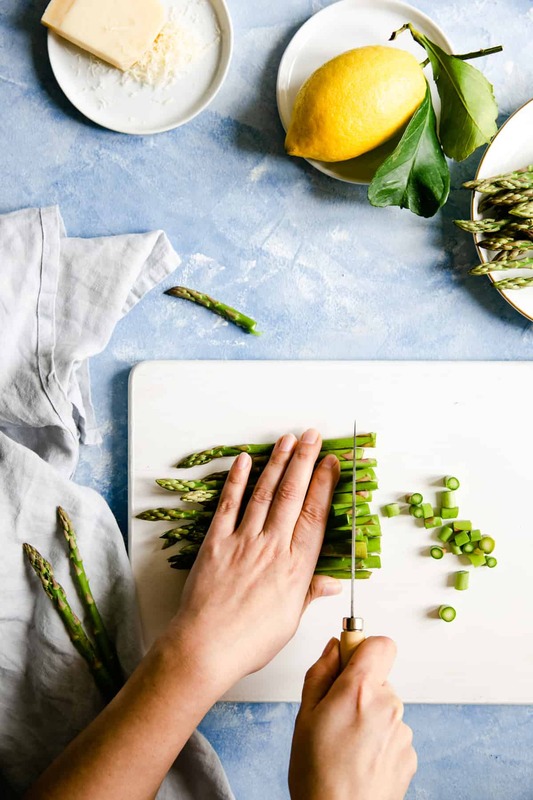 It combines beautiful, fresh and seasonal ingredients: wild garlic and asparagus. You know winter is truly over, when these two start making appearances in local shops and farmers markets! The dish will make great weekday dinner or weekend lunch. It is creamy, yet light in texture and packed with delicious, fresh flavours. 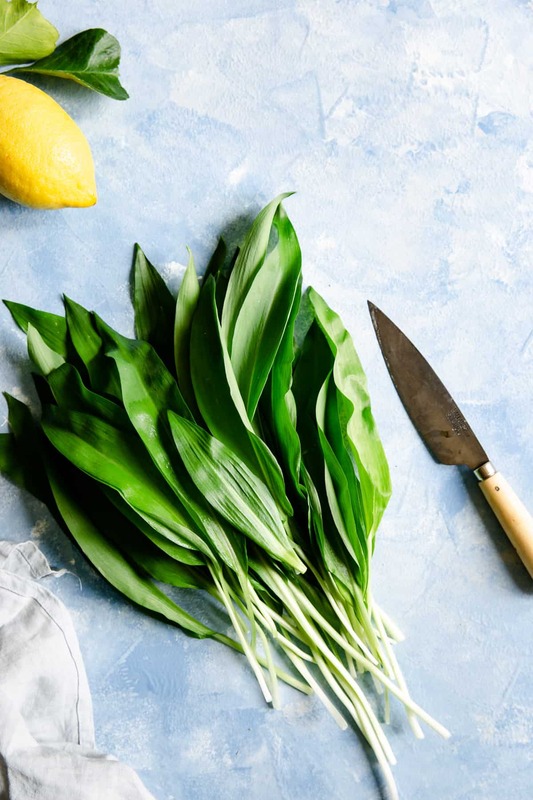 What is wild garlic and where to find it? Wild garlic is a plant native to Britain (it can be found across Europe and Asia), it is also known as Bear leek or Bear’s garlic. It can grow to heights between 45- 50 cm and has edible flowers and leaves. Leaves can be used to cook soups, sauces and pestos. They appear in March and are best picked when young. The flowers start to appear around April time, lasting until June. They add a garlicky punch to salads and sandwiches. You can find wild garlic in the woodlands floors in Spring. You know you are on the right track, if there is distinctive, attractive, garlicky smell in the air. If you are planning on going on a foraging adventure, please make sure to do so responsibly. 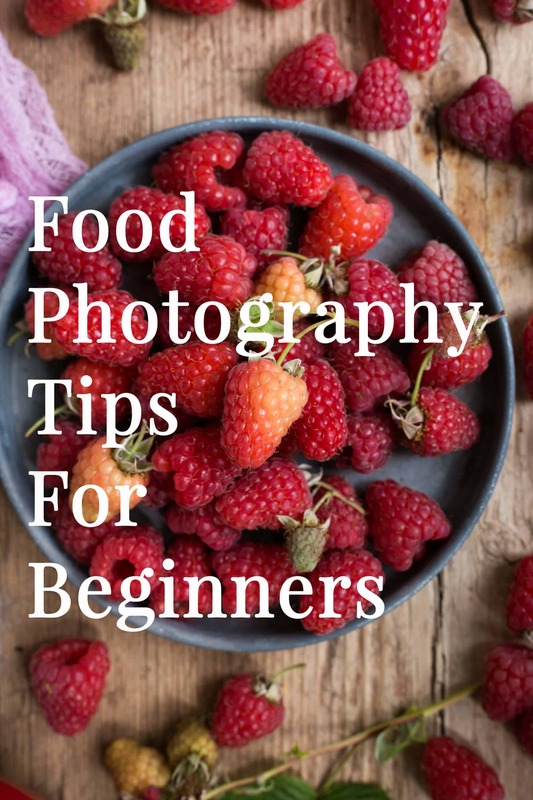 Learn how to identify the plant, and never eat anything you are unsure of. You can find more information about this fantastic plant on Countryfile website. This dish requires only few, simple ingredients, most of which, you probably already have in your kitchen. If you can’t find any wild garlic in your local woodlands, farmers market or local farm shops are a good places to look. Alternatively, you can use spinach instead of wild garlic, although this will alter the flavour of the whole dish. These are the basic ingredients. I have added some lemon zest and lemon juice to my recipe, but they are optional (although, I think they add a lovely zing and flavour). 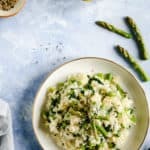 How to make wild garlic and asparagus risotto? As for the next step, heat the olive oil and butter in a large pan, over a medium heat. Add chopped shallots and fry them for 3-4 minutes, until they start to soften. Next, add the chopped garlic cloves, and fry for another minute. Tip the risotto rice into the pan, give it a stir, then pour in the white wine and keep stirring until rice absorbs it all. After that, start adding the vegetable stock, one ladle at the time. Only add another ladle, once the previous one have been fully absorbed by the rice. After about 10 minutes, add the asparagus and wild garlic, followed by more stock. You don’t want to add the vegetables too soon, as they will get all mushy, therefore it’s always best to add them towards the end of cooking. Add lemon juice and zest, plus grated cheese. Take the pan off the heat and cover it with lid. Allow it to stand for few minutes, giving the rice a chance to absorb any extra liquid. 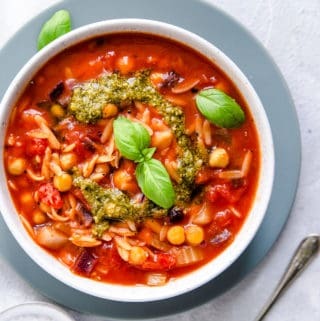 Divide into bowls and sprinkle with more grated cheese and enjoy! Thanks for reading today’s post! I hope you guys enjoyed it, and as always, feel free to leave me a comment and a rating below. Also, remember that you can follow me on my Instagram, Facebook and Pinterest. Have a great, sunny week ahead! Beautifully creamy and full of flavour wild garlic and asparagus risotto. This easy dish is great celebration of the new, fresh produce that Spring has to offer! In a large pan, heat the olive oil and butter, then add chopped shallots and fry for 3-4 minutes until they begin to soften. Add chopped garlic and fry for another minute. Add the risotto rice to the pan and pour in the white wine. Stir it all together and allow the wine to bubble until it evaporates, stirring often. Leave it on medium heat, and keep pouring the vegetable stock, one ladle at the time, stirring frequently and only adding another ladle of stock when the rice absorbed all the liquid. After about 10 minutes, add the chopped asparagus and wild garlic. 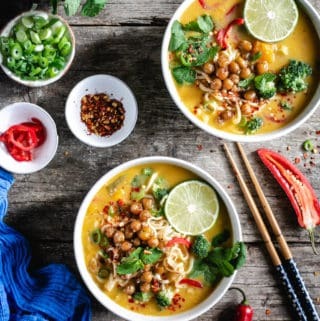 Add more stock and after another 5 minutes, when rice is just cooked but still has some bite to it, add the lemon juice and zest and grated cheese. Cover with lid, take off the heat and allow it to stand for few more minutes, so the rice can absorb any extra liquid. Give it a stir, divide into serving bowls. Sprinkle with some more grated vegan cheese and enjoy! If you would like to receive future posts and recipes straight to your inbox, make sure to subscribe to my mailing list! Hey Sherri! Thanks so much for stopping by and for your comment! Risotto is a regular on our weekly menu, plus any leftovers (if there are ever any!) can be turned into arancini! Glad you like this recipe! I am trying to not lick the screen! I love risotto and you have added my two favorite veggies. I can’t wait to make this. I’m so glad to hear that Jacquelyn! I hope you will enjoy the recipe as much as I did! I love this recipe! 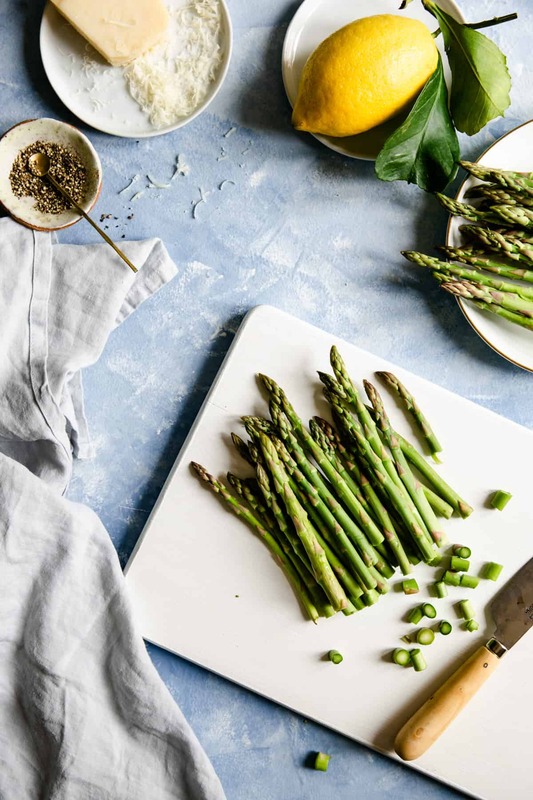 Asparagus is so good this time of year and can’t wait to use it in this recipe. Plus garlic is probably one of my favorite flavors of all time. Thanks for posting! Hey Rachel, thanks so much for stopping by! 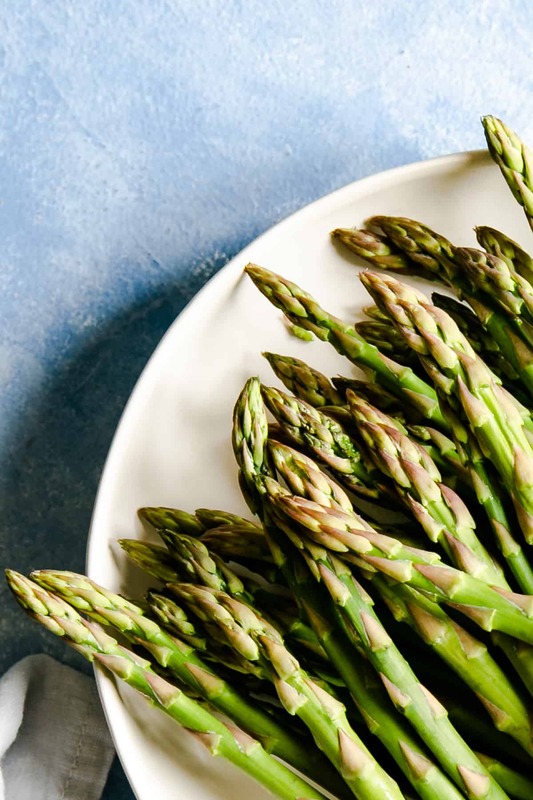 Yes, new season asparagus tastes amazing, I could eat it for breakfast, lunch and dinner! Glad you like this recipe hun! This looks so delicious! Love Risotto so much! Thanks so much my lovely friend! I could eat it for breakfast, lunch or dinner! 😉 happy Friday! Thank you Aleta! Hope you and hubby will enjoy this risotto as much as I did! 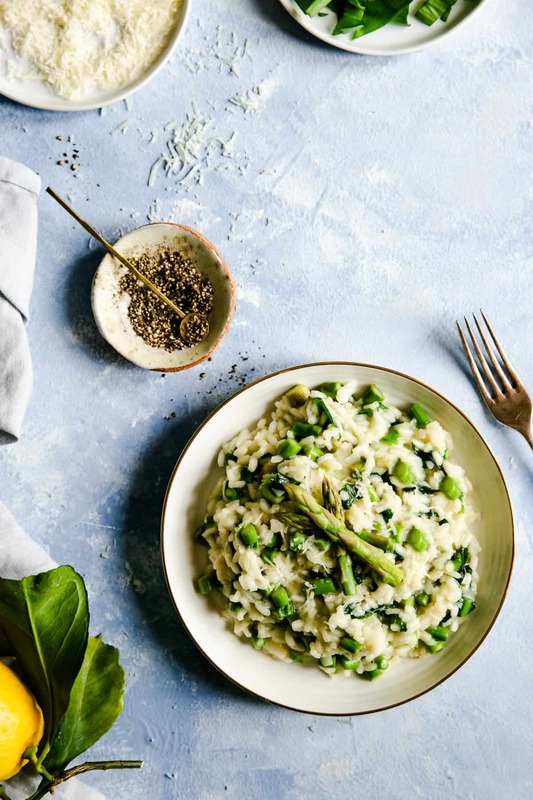 I could eat risotto every single day, and this recipe is perfect for spring. I’m making this as soon as I can get some asparagus. That’s so great to hear Colleen! I’m the same, will be happy to eat it every day 😉 hope you will find some asparagus very soon, and will enjoy this recipe! Thanks so much for stopping by! 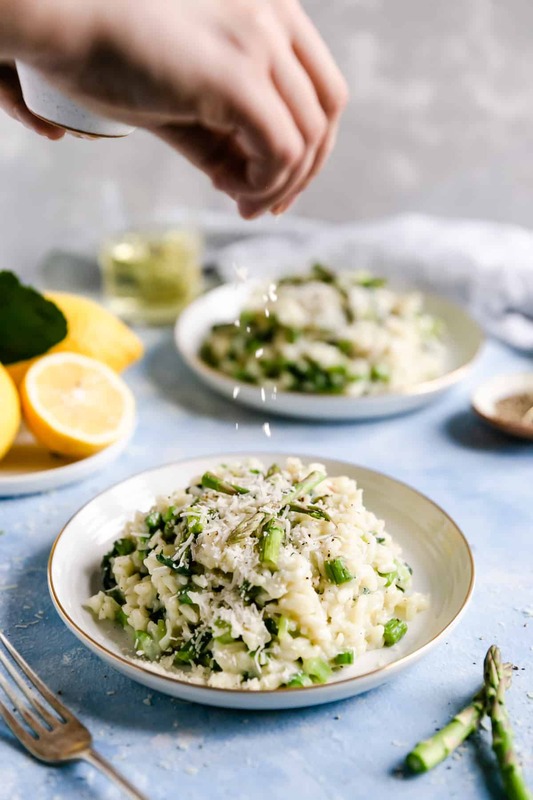 I love making risotto and this recipe looks so spring-y! 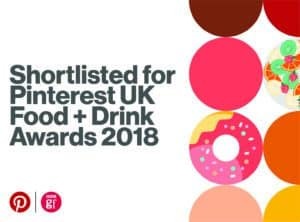 We’ll definitely have to add it to our menu in the coming weeks. I know my husband will love the fact that it has asparagus (which is his favorite vegetable)! Hey Claire, I’m so happy to hear that! If your hubby loves asparagus, then I’m pretty sure he will enjoy this recipe! Sounds like a great spring side dish! I would have never of thought to pull asparagus into risotto, but now I can’t wait to give this a try. Thanks Deseree, I hope you will give it a go, asparagus works wonderfully with risotto and it’s definitely worth trying out! 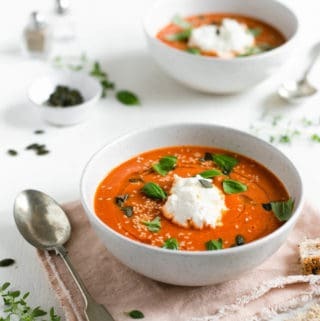 I am absolutely LOVING this recipe! Every ingredient is screaming spring time and freshness! What a perfect side dish to pair with so many meats!! Thank you Amanda! I’m really pleased to hear that you like this recipe so much! Let me know if you try it! What a perfect dish to make after a trip to the farmers market. Can’t wait to try this for an upcoming dinner party! Hey Kylie, thanks for stopping by and your comment! Risotto is a great crowd pleaser, and any fresh produce goes so well with it! Hope your guests will enjoy it! Yum! Love a good risotto! And your ingredients pics are stunning! All the pics are gorgeous but I do especially appreciate the in process ones. Thanks so much for sharing :). Thanks so much Daniela, I’m so glad to hear that you have found the photos helpful and that you like the recipe. Big hug! This looks so perfectly creamy and I’m sure garlic and asparagus make a great combination with risotto. Its got so much goodness, I want some right now !! 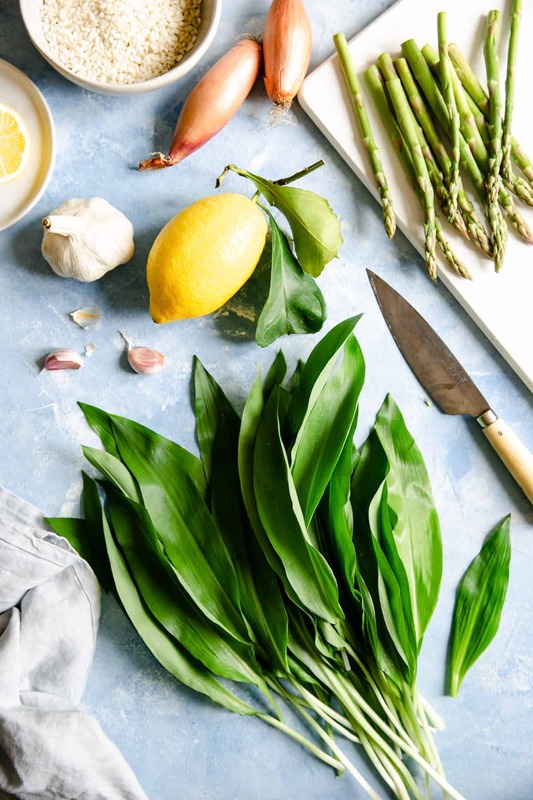 It is really tasty combo Alisha, if you can get your hands on any wild garlic, I really recommend pairing it with the asparagus. Thanks so much for stopping by!